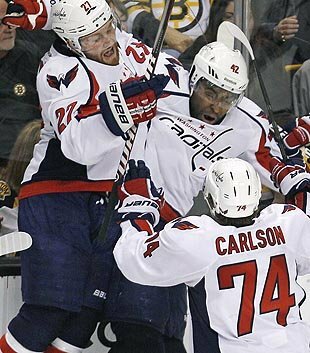 Joel Ward of the Washington Capitals was born in Toronto to parents who migrated from Barbados. He used to hear racist taunts playing in youth hockey tournaments, but told the Washington Post this season that "I've [heard] nothing in the NHL." On Wednesday night,Ward scored the series - winning goal against the Boston Bruins in overtime of Game 7. The kind of racist language that Ward had avoided throughout his NHL career bubbled to the surface like sewage on social media. "Hey Joel Ward!! You [expletive] spear chucking monkey, why don't you actually DO SOMETHING. You're totally irrelevant"
"How the [expletive] did Joel ward get out of my plantation? #WheresMyCotton"
"Warning to Joel Ward. Your one of three black guys in Canada. I will find you…and I will kill you." We will as an organization support Joel Ward. He has been a great teammate and a great citizen. He is now the star of stars in our city for his heroics last night. He is a friend and a fantastic player — who delivered — as advertised for us and our fans in the playoffs. This is a small collection of tweets, and some may not even have been hockey fans; and almost none of them were directed to Ward's feed. It's the kind of thing you might see on any night on social media about black athletes -- a sad commentary, no doubt -- magnified by the circumstances of Game 7.